HortiDaily, an online resource for for the international horticultural industry with daily articles and posts, just released an article discussing the exciting possibilities of improving taste in hydroponics using OceanSolution. Click on the link below to read more. Florida Weekly recently came out with an article about entrepeneurs who run businesses that are beneficial for the waterways around Florida. 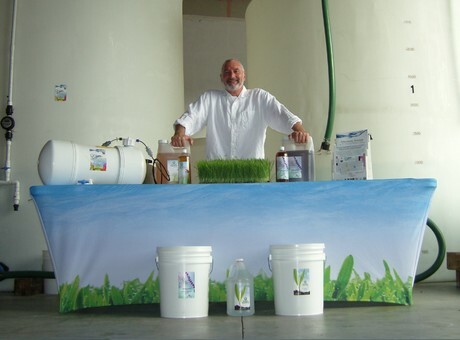 "John Hartmann, founder and CEO of OceanSolution (the trademark name) by OceanGrown Inc., in Fort Pierce, has just spent the last decade creating and marketing fertilizer for big agricultural concerns and small farms or backyard gardeners alike, environmentally benign and made from deep-sea water." Received a call from a farmer who is testing OceanSolution on caggage. The farmer said, "you need to get out here and see these cabbages before someone takes them all thinking they are basketballs." John Hartman has found a solution for the problem of fertilizer pollution, one of the main sources of chemicals poisoning the Indian River Lagoon. His company, OceanGrown Inc., makes a non-toxic and potentially revolutionary fertilizer composed of concentrated seawater drawn from the Atlantic on the far side of the Gulf Stream that not only feeds the growth of plants but increases the flavor and nutritional content of food, according to multiple university and industry studies. The University of Missouri Divison of Plant Sciences performed a test to see whether cattle preferred pasture grass fertilized by OS. GPS collars were used to record the locations of the cattle the entire time thy were on the pasture. According to the researcher, "At the 100 lb/acre N rate, adding (OceanSolution) improved grazing preference nearly 5 fold. Sean and his crew have been using Ocean Solution on their vegetable garden, getting great results. He's been able to provide the zoo kitchen with fresh produce on a regular basis reducing purchases. I've also been using it on landscape materials and recently planted annuals throughout the zoo with beneficial affects. One of the samples you gave us initially I've been using on my interior foliage at home and the condition of the plants is excellent." - Tom Thumb More news coming soon! Update from Juliana Trigoso Friday at the Zoo was a great success. John Hartman and I met with Tom Thumb and his staff. Sean and Don will be leading up the OceanGrown project. 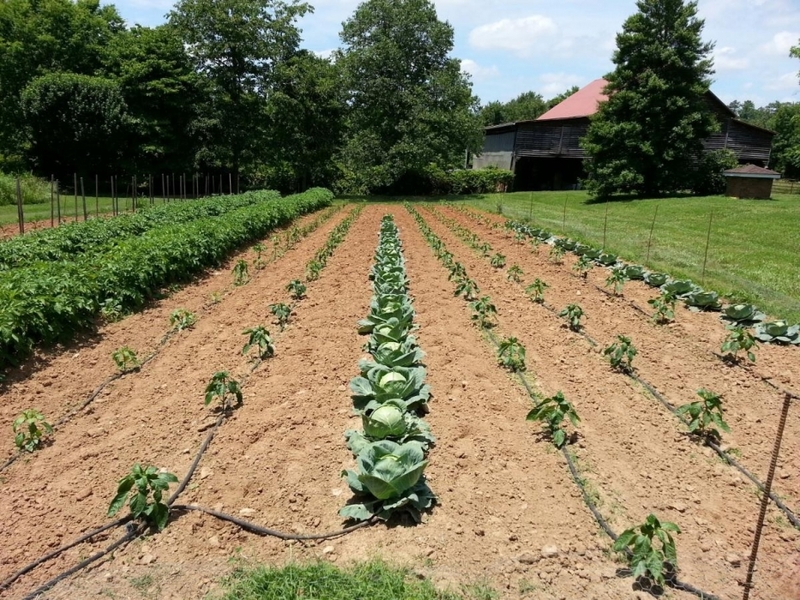 Don will be applying it to their fruit, vegetable, fodder and specialty food gardens. Which, up until OceanSolution, the vets had not permitted the use of any products to be used. “The farm is struggling with caterpillars, especially,” said Don. Hartman explained, “Unhealthy plants are especially vulnerable to pests, OceanSolution will help to fortify your plants from the inside out, and that should help keep the caterpillars at bay.” Sean will be using OceanSolution on the landscaping plants. Sean was telling John Hartman, that applying anything to the landscaping is a bit tricky for a few reasons. First, the animals have to be moved away from the area during application and then returned, which is not only labor intensive but also takes staff coordination. Second, some areas were not ever permitted to be treated due to the sensitivity of the animals nearby. Furthermore, the areas being treated were still having some major plant health issues. Thanks to OceanGrown, now the application of Plant Nutrients will be a cinch. “No more having to relocate animals or starving plants because you fear harming the wildlife,” said Hartman. We will be checking back in with the Miami Metro Zoo soon and we will keep everyone posted! The Senate Environment and Public Works Committee has reported a controversial bill to restore environmental protections for wetlands, streams, lakes and drinking water sources that were eroded by 2001 and 2006 Supreme Court decisions. The committee passed the Clean Water Restoration Act in a 12-7 party-line vote. President Barack Obama has signaled he would sign the bill if Congress passes it. Sen. Mike Crapo (R-Idaho), a member of the environment committee, voted against the bill and indicated he would try to filibuster it on the Senate floor. To read more click here. Tallahassee, FL -- In a major step forward for the environment, President Barack Obama's administration has signed a consent decree in which it agrees to set legal limits for the widespread nutrient poisoning that triggers harmful algae blooms in Florida waters. "This is a refreshing change of policy after almost a decade of foot-dragging by the Bush administration," said Earthjustice attorney Monica Reimer. "It is a real milestone in the struggle to safeguard lakes, rivers and estuaries throughout Florida." To read more click here. Having been in the flower and vegetable farming business for a while now, I receive a large number of trade publications (so many, in fact, that I think my magazines alone account for the harvesting of a small forest each year.) I never have enough time to read all of them and the ones I have tried to cancel continue to come anyway. Every once in a while, however, I do get the chance to sit down with one and I recently found an interesting article that I would like to share with you. It's going to sound pretty weird, and I have to say up front that I've never tried this myself, but the information comes from the Rutgers University Vegetable Research Farm in New Bruns-wick, N.J., so I have to assume it be at least somewhat reliable. UC Davis researchers will receive $2.8 million in new grants to study the use and impacts of nitrogen, a hero of the agricultural revolution that is increasingly viewed as a worrisome source of water and air pollution and potent greenhouse gases. "This is one of the most important and least publicized environmental issues we face: Escaped nitrogen from agricultural production affects the quality of our air, water, and soil and has huge potential to contribute to climate change," said Tom Tomich, director of the Agricultural Sustainability Institute at UC Davis. The NPK rates would be determined through soil testing this fall or next spring, depending on conditions and timing. These trials will be supervised by Dr. David Franzen (Ph.D.), Soil Specialist at NDSU since 1994. The results will be shared with OceanGrown Distribution, along with OceanGrown and will be published in a suitable peer-reviewed journal. 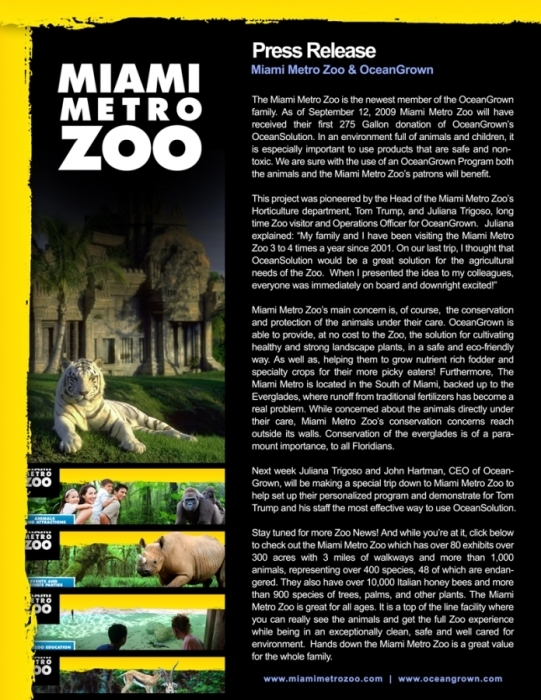 The Miami Metro Zoo is the newest member of the OceanGrown family. 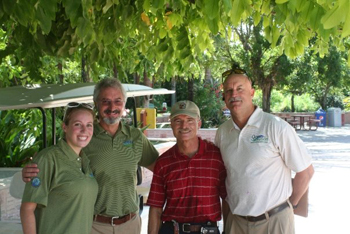 On September 12, 2009 Miami Metro Zoo received their first 275 Gallon donation of OceanSolution. Juliana Trigoso and John Hartman, CEO of OceanGrown, made a special trip down to Miami Metro Zoo to help set up their personalized program and demonstrate for Tom Trump and his staff the most effective way to use OceanSolution. 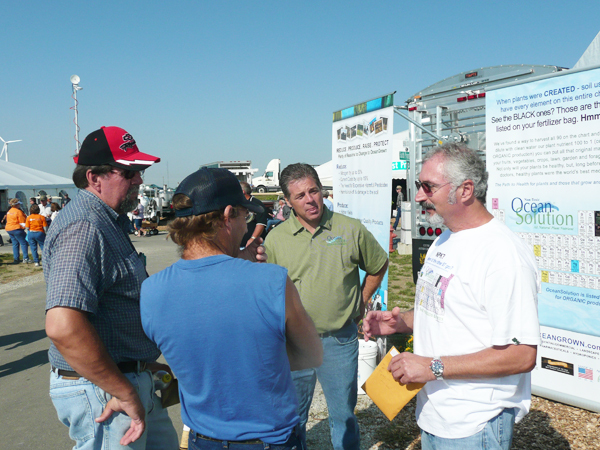 The Farm Progress Show in Decatur, IL – Sept. 1 – 3 was a great success. 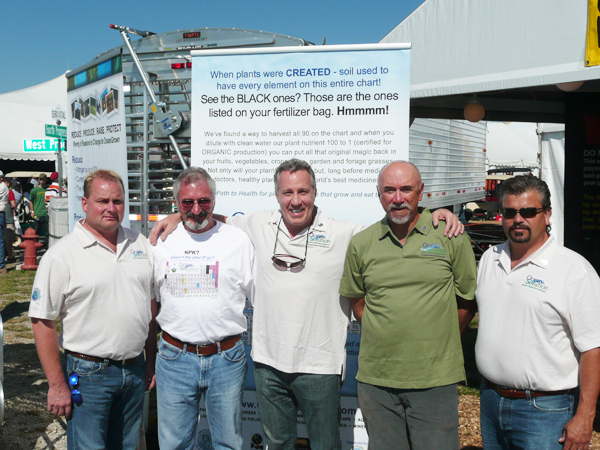 Farmers from all over the World visited the OceanGrown Booth. Dewey Graff, Kim Callis were in the Booth, as well as, Dan Sturlaugson - OGD Sales - Midwest and Todd Stenerson – OGD Sales – Midwest, also a farmer and user of the OceanGrown Program. The OGD Team responded to inquiries from farmers and Ag. Companies, large and small. Of note, was the concern from younger farmers that had family members, who had gotten cancer from all the years of working around all the toxic chemicals associated with current farming practices. A lot of these younger farmers are now married with children and do not want to suffer the same fate. 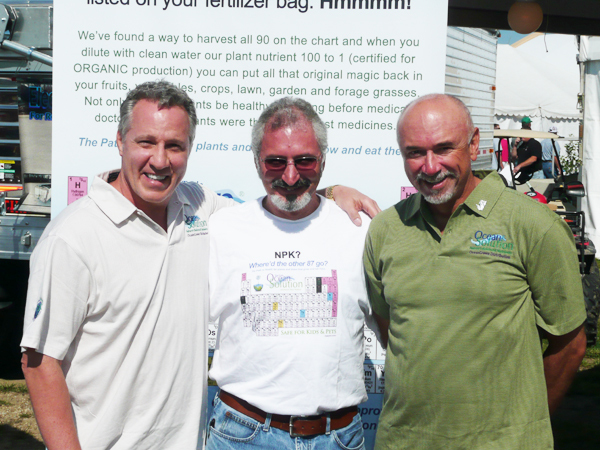 They were particularly interested in the fact that the OceanGrown Program was non-toxic and chemical free. That, coupled with all the many other benefits of the OG Program, garnered a lot of attention. We had over a dozen attendees from two of our new distributors. We plan on having another training Session at the beginning of September. We will keep everyone posted! Are you ready for some "innovative" new vegetables? If you are concerned about this approach to our food system, I encourage you to write to the Monsanto contacts highlighted after the first article. ST. LOUIS and MONTEREY, Calif., June 23 /PRNewswire-FirstCall/ -- Monsanto Company (NYSE: MON) announced today it has entered into a collaboration agreement with Dole Fresh Vegetables, Inc., to develop new products that will enhance consumer vegetable choices. HR 2749 would impose an annual registration fee of $500 on any "facility" that holds, processes, or manufactures food. Although "farms" are exempt, the agency has defined "farm" narrowly. And people making foods such as lacto-fermented vegetables, cheeses, or breads would be required to register and pay the fee, which could drive beginning and small producers out of business during difficult economic times. 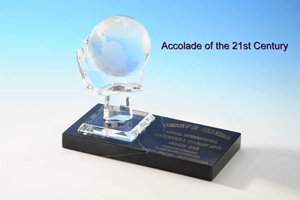 Tampa Bay, Florida is recognized and known worldwide as the home of the Annual International Cordon d’ Or – Gold Ribbon Culinary Academy Awards for Culinary Books, Cookbooks & Culinary Arts. Every year, Award Winners fly into Florida from across the USA, Canada, Mexico, Europe, Korea and Australia, to accept their ‘Culinary Academy Awards’. There is something going on in Washington that we need to inform everyone about. Especially if you are tired of over-empowering government and big corporations. It is called the Food Safety and Modernization Bill of 2009. It is a bill that is currently being moved through the US Congress. The bill has been introduced by a Connecticut Congress Woman Rosa DeLauro (D) whose husband Stanley Greenburg works for Monsanto. What the bill essentially does is regulate small farmers out of the business of growing food leaving the Monsantos and Archer Daniels Midlands of the world free to feed us whatever they please. We cannot afford to allow industrialized agriculture squeeze our smaller Ag and Livestock producers out of business. Please take a few minutes to research the subject by searching " Food Safety and Modernization Act of 2009", or "HB 875"